What the voters found important in the Brexit referendum and the US elections? After the two most turbulent political events of 2016, the UK Brexit referendum and the victory of Donald Trump in the US Presidential elections, one cannot help to make comparisons between the two. Both attracted the same type of voter support based on several cleavages: urban vs rural, young vs old, more vs less educated, and particularly in the US white vs non-white. However little attention has been given to specific issues the voters found important in both elections. Pollsters had this data, as asking for voter sentiment is a standard part of their surveys, but have failed to include it in their projections of the final result. Let us take a quick look into what the most important issues were in the Brexit and US election campaigns and how this could have been used to anticipate if not voter choices, then at least the trend of support for each candidate/option. Hindsight is a wonderful thing, but saying ex-post that both of these outcomes were predictable is not doing a favor to anyone. However we feel that in future elections polls should pay more attention to voter mood, not just their answer who to vote for. Which is why the following hindsight analysis can be useful. Several months before the Brexit referendum the three most important issues to UK voters were immigration, the NHS (an issue that always has high salience in Britain), and Britain’s relationship with the EU, according to Opinium. The recovering economy, the most important issue since 2008, was now in a distant fourth place, on par with inequality and housing. At about the same time, when asked who is to be blamed for Britain’s biggest current problems, a poll by IPSOS found that the top two answers were immigrants coming to work for lower wages (32%), and rules and regulations imposed by the EU (28%). The decisions of the Labour and Conservative governments (Labour deficit-spending policies and Conservative austerity policies) came third and fourth. As the referendum date was approaching the volume of voters which placed an emphasis on things like immigration was expanding. In June 2016 YouGov reported that the issue of immigrants coming into the UK became the number one determinant of voter choice in the upcoming referendum. A total of 33% of the voters put immigration as the most important issue helping them make their decision, whereas 28% said they were concerned with the impact Brexit would have on the UK economy. 12% of the voters said they care about Britain’s ability to make its own laws, and 11% expressed concerns about the impact of the referendum result on public services (like the NHS). It is easy to see how the Leave campaign successfully picked up the voters’ sentiment and tailored their messages precisely on immigration and the NHS. 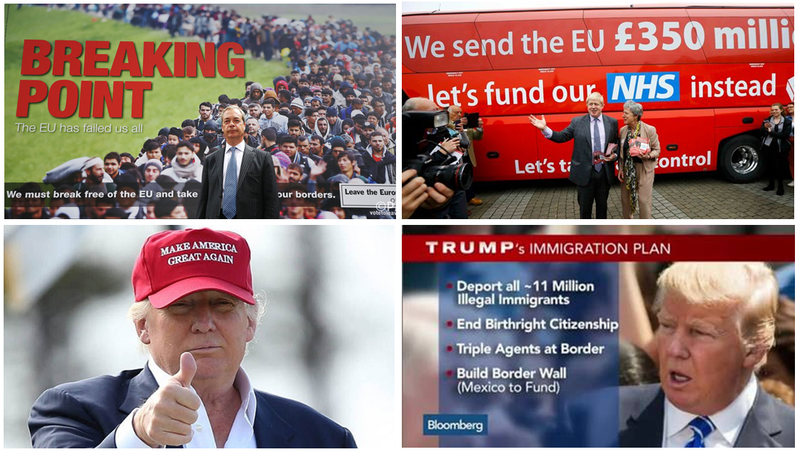 Nigel Farage got a lot attention with his ‘breaking point’ posters featuring a picture of refugees crossing the border into Europe, while arguably the biggest success of the campaign was the big red bus in which Boris Johnson was riding around featuring a huge sign saying that Britain is sending £350m to the EU which should be taken back to fund the NHS instead (both showed below). In the US elections the story was similar. The economy was decreasingly important in the voters’ final choices. According to Gallup, in the 2012 elections 70% of the voters emphasized an economic issue over a non-economic one. By 2016, this has completely shifted as only 30% of voters in October 2016 recognized an economic issue (like the economy in general, unemployment, or the budget deficit) as the most important one. 70% chose a non-economic issue. The most important one was dissatisfaction with the government, followed by race relations, immigration, and terrorism and national security. Not only that, but according to PewResearch immigration has almost doubled in its salience since the 2012 election, when only 40% of the voters raked it very important, to 70% of voters raking it very important in 2016. Naturally, the salience of an issue differed with electoral support of a particular voter. PewResearch reports that Trump supporters all found the economy, terrorism, immigration, trade policy, and Supreme Court nominations as more important than Clinton voters. Clinton supporters on the other hand placed a much higher emphasis on treatment of minorities, education, health care, and the environment. It is difficult to say which of these prevailed on a national level given that Clinton did get more votes than Trump, so it would have been more useful to look at each of these issues on a state-by-state level, particularly in the key swing states like Pennsylvania, Florida, Ohio, or North Carolina (each won by Trump), and the surprise states like Michigan and Wisconsin. SurveyMonkey offers an insight as to how the electoral map would look depending on which issue the voters found most important. If only those who ranked the economy as the most important issue would vote, Trump would have won in a landslide (winning in all but a few states like CA, NY, MA and MD). For those ranking immigration first he would have won every state except for CA. On the other hand if only voters who found foreign policy or the environment to be important voted, they would have given Hillary a landslide, as she would win every state. When looking at those who ranked health care as very important, the result would be a tie. The Trump campaign tailored its messages around the very key issues aimed at galvanizing their supporters – the economy (“Make America Great Again”, losing jobs because of trade with China and Mexico), immigration (the wall, terrorism, bashing Mexicans, also job losses), and particularly the voters’ dissatisfaction with the government (“drain the swamp”) which was delivered as a key message against Clinton (“lock her up”) – a personification of a typical career Washington politician. Her email scandals helped deliver that message as well. Finally, it was interesting to see that about an equal amount of voters, 33%, said that they are voting for Clinton or Trump as a protest vote (voting against Trump or Clinton). Trump supporters emphasized his appeal as an outsider who will bring change and his policy positions on immigration and the economy. Clinton supporters valued her experience, her policy issues and her personality. Only 5% of voters would vote for one or the other just because they were Democrat or Republican.